There is no better place for one of fall’s staple ingredients, squash, to be other than wrapped in bacon and sitting aside a crispy glazed ham on your holiday table. With the sweetness of the maple and the saltiness from the bacon, this recipe is sure to become a staple holiday dish for years to come. This recipe is courtesy of courtesy of celeb chef, George Duran for COOKINA. Recipe makes 3-4 Servings. Bring maple syrup, honey and thyme just to a boil in a small saucepan over medium heat. Reduce heat to low and continue to simmer for 10 minutes. For the butternut squash, preheat oven to 425F. Split each squash lengthwise and peel and cut the seedless end into 4-5 inch long slices that are roughly a square inch thick. 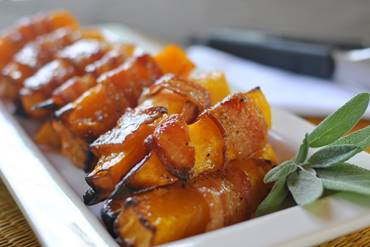 Wrap each squash stick with a half-strip of bacon and place on a Cookina Cuisine lined baking sheet. Season with pepper. Roast for 15 minutes, remove from the oven and brush liberally with the maple glaze. Roast for another 15 minutes and remove from oven and brush with more of the maple glaze. Let rest 5-10 minutes before serving. Garnish with any additional maple glaze and chopped thyme. This is perfect because I have a butternut squash and wanted to do something different with it. I love this combination of sweet, smokey and salty flavors.